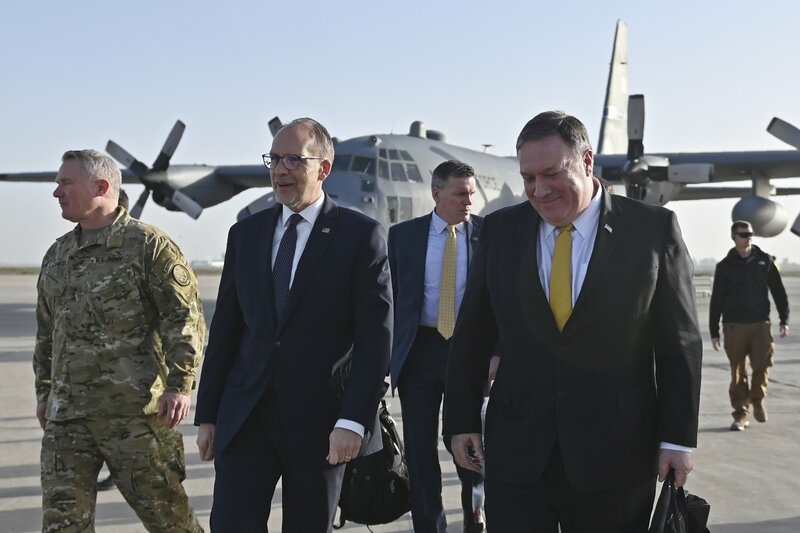 BAGHDAD — U.S. Secretary of State Mike Pompeo visited Iraq on Wednesday in an unannounced stop on his Mideast tour meant to promote the White House’s hard-line position on Iran. The trip comes amid confusion over conflicting statements by President Donald Trump and senior U.S. officials about a planned U.S. troop withdrawal from Syria, where Iran is backing President Bashar Assad in that country’s civil war. Pompeo and Iraqi Prime Minister Adel Abdul-Mahdi discussed efforts to ensure the “lasting defeat throughout the region” of the Islamic State group, whose tactics have shifted to guerrilla warfare after losing nearly all of the territory the militants once controlled in Iraq and Syria. The two also discussed American support for Iraq’s energy independence, said Deputy State Department Spokesman Robert Palladino. Iraq imports electricity and natural gas from Iran to meet its energy needs. In Jordan on Tuesday, Pompeo said the pullout would not detract from U.S. efforts to contain Iran’s considerable clout in the region. The White House reinstated sanctions against Iran last year for allegedly violating the 2015 nuclear deal championed by former President Barack Obama. International nuclear inspectors had said there was no evidence that Iran was violating the deal. Pompeo on Wednesday also met with Iraqi President Barham Salih, Foreign Minister Mohamed Alhakim and Parliament Speaker Mohamed al-Halbousi. He stressed the U.S.’s support for strong, bi-lateral relations based on the 2008 Strategic Framework Agreement between the two countries, five years after the U.S. invasion that deposed former dictator Saddam Hussein and plunged Iraq into civil war. Pompeo’s visit is the third high-profile visit by an American official to Iraq in the last month. Iraqi politicians were incensed when Trump last month made an unscheduled visit to a U.S. base in western Iraq without also meeting Prime Minister Adel Abdul-Mahdi, as his predecessors Obama and George W. Bush had done. Pompeo was expected in Cairo later on Wednesday.